In rare circumstances, a left aortic arch may give rise to a descending aorta that crosses the midline and gains the right side of the thoracic cavity. Lying immediately anterior to the vertebral body, this may compress the carina or proximal left main bronchus and cause symptoms of extrinsic compression of the airway. This report describes the surgical technique employed in an infant for relief of bronchial compression. A male child aged 5 months was evaluated for respiratory distress that required mechanical ventilation. Investigations showed no intracardiac anomalies. A juxta ductal coarctation of the aorta (CoA) and a large persistent ductus arteriosus (PDA) were identified by echocardiography. Compression of the left bronchus was then confirmed by chest roentgenography and fiberoptic bronchoscopy. Computed tomography (CT) scan revealed near obliteration of the left main bronchus due to extrinsic compression between the posteriorly located descending thoracic aorta that traversed to the right from a left-sided aortic arch and the right pulmonary artery anteriorly [Figure 1]a and [Figure 1]b. The aortic arch and anatomy of the vascular ring are shown in [Figure 2]a and [Figure 2]b. The infant was scheduled for surgical repair. Besides routine monitoring lines, a femoral arterial pressure monitoring line was inserted. 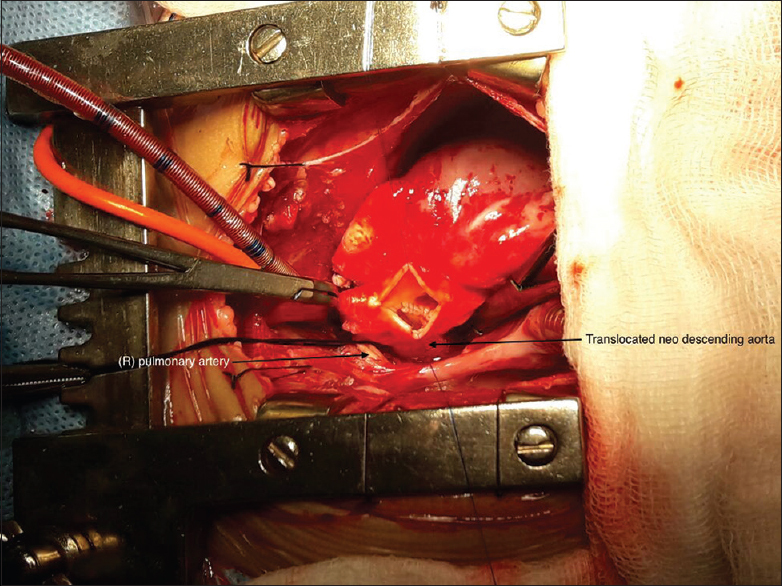 Through median sternotomy, the aortic arch and vessels from it were extensively mobilized. The PDA was also dissected and encircled. The area of the CoA was identified and the descending aorta was mobilized as were the right and left pulmonary arteries. The first few pairs of intercostal arteries were divided between vascular clips as were the smaller tracheal and esophageal branches that could be accessed from the superior dissection. Following this, the right atrial appendage was retracted inferiorly and the aorta to the left side. The posterior pericardium in the transverse sinus was incised to expose the descending thoracic aorta. The esophagus and carina being to the right and superior aspects, respectively, were safeguarded. The descending aorta was encircled and any intercostal vessels and esophageal and tracheal branches of the aorta were interrupted. The child was heparinized for cardiopulmonary bypass. Aortic and single venous cannulation was performed following which cardiopulmonary bypass was instituted. The ductus arteriosus was interrupted and the ends secured. The perfusate was cooled to 18°C. Further mobilization of the aorta and the arch vessels was performed on bypass. Similarly, the descending aorta was also extensively mobilized. A plane was thereby created anterior to the aorta and posterior to the tracheal bifurcation to deliver the aorta inferior to the left bronchus later. Following cardioplegic arrest, the aorta was transected at the isthmus immediately adjacent the left subclavian artery. A vascular clamp was placed on the descending aorta in the posterior mediastinum. The transected proximal end was secured. The aortic arch thus ends blindly at the left subclavian artery. 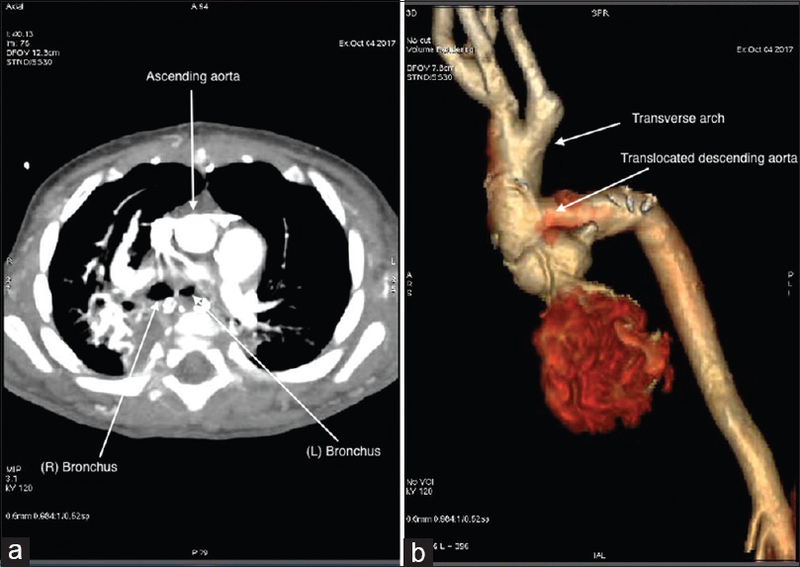 Following this, the descending aorta was delivered into the transverse sinus beneath the left main bronchus [Figure 3]. The descending aorta was kept clamped throughout this maneuver so as to maintain a distal aortic pressure of approximately 45 mmHg. A longitudinal aortotomy was then performed in the proximal ascending aorta to access the posterior wall of the aorta. A wide opening was then created posteriorly immediately downstream from the sinotubular junction. The left coronary artery was protected during this maneuver. The descending aorta was then anastomosed end to side to this opening in the posterior wall. The aortotomy was then closed [Figure 4]. The child was rewarmed and weaned off bypass uneventfully. There were no gradients between the upper and lower extremity arterial pressures. The aortic cross-clamp time was 50 min with 45 min of descending aortic occlusion time. The child required ventilation for 7 days to failure to optimize respiratory parameters. Before extubation, a fiberoptic bronchoscopy confirmed an open left bronchus. CT scan showed normal caliber of the left bronchus and the translocated neodescending aorta [Figure 5]a and [Figure 5]b. Echocardiography in the postoperative room confirmed good flows in the descending aorta as evidenced by equalization of arterial pressures in the upper and lower limbs. There were no features of spinal cord injury or distal end-organ hypoperfusion in the postoperative period. On his first review visit 1 month following the procedure, the child remained clinically well with no features of airway obstruction. His chest roentgenogram showed no features of bronchial compression. The ductus arteriosus in this instance was probably a “red herring,” and its division alone would have in all likelihood not relieved the compression. Procedures such as posterior aortopexy and pulmonary arteriopexy have been described in the literature., However, these are not known to give consistent long-term results in this setting. 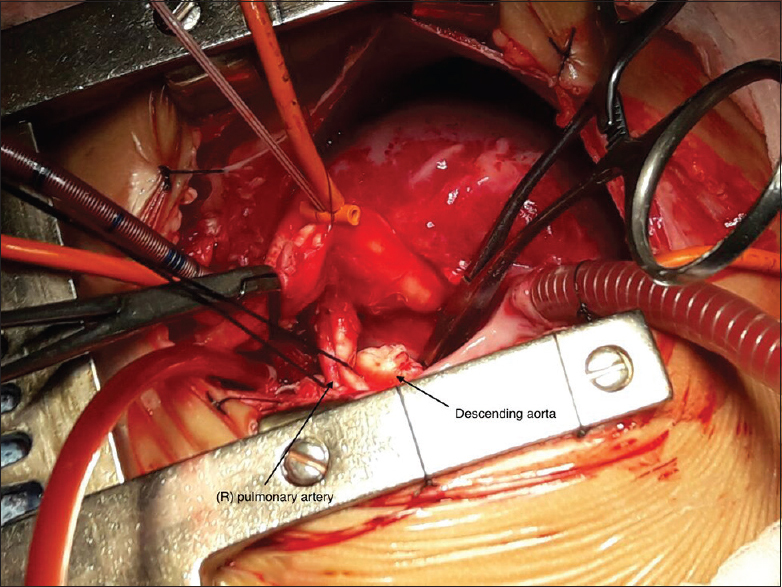 This operation requires extensive dissection in the posterior mediastinum with important structures lying adjacent. It therefore becomes mandatory for a surgeon to attribute all the features of bronchial compression to this anomaly alone to justify this procedure. Care is required to avoid damage to the recurrent laryngeal and vagus nerves during mobilization of the arch and descending aorta. Caution is also required to prevent injury to the esophagus, carina, and left main bronchus. Branches of the descending thoracic aorta namely the intercostal vessels and the tracheal and esophageal branches require to be secured before division to avoid potentially troublesome bleeding that is difficult to identify later. The duration of descending aortic occlusion may be as long as 45 min or more. It is therefore important to cool the perfusate adequately to preserve the spinal cord and distal end organs during this period. The descending aortic clamp kept in place until antegrade flow reestablished helped maintain a mean pressure of approximately 45 mmHg due to the collateral circulation. This and hypothermia may have contributed to protection of the spinal cord during this long period of aortic occlusion. The descending aortic translocation operation is an effective and reproducible technique. It is a valuable procedure for the relief of significant airway compression in rare cases of vascular ring caused by a descending aorta traversing the midline to the right side from a left-sided aortic arch. Kussman BD, Geva T, McGowan FX. Cardiovascular causes of airway compression. Paediatr Anaesth 2004;14:60-74. Herbert J, Guzmán-Pruneda FA, Sumner EE, McKenzie ED. Simultaneous repair of right-sided coarctation and vascular ring. Ann Thorac Surg 2015;100:334-6. McKenzie ED, Roeser ME, Thompson JL, De León LE, Adachi I, Heinle JS, et al. Descending aortic translocation for relief of distal tracheal and proximal bronchial compression. Ann Thorac Surg 2016;102:859-62. Goldman SA, Rimell FL, Meza MP, Newman B. 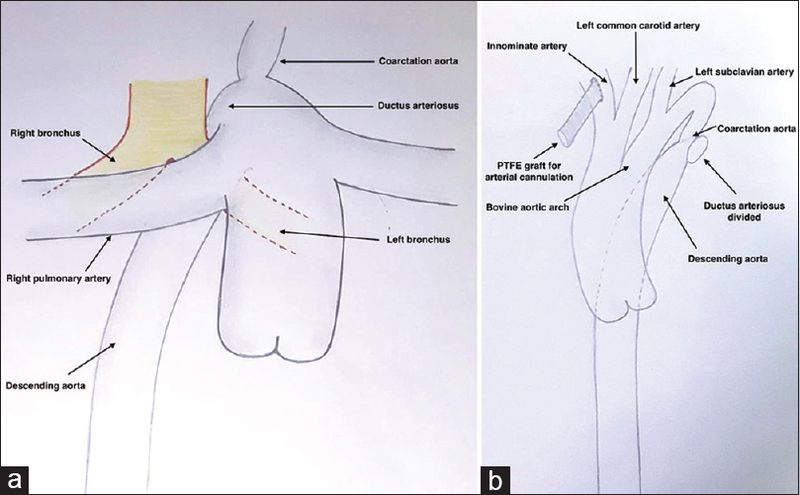 Diagnosis and management of left main stem bronchus compression. Ann Otol Rhinol Laryngol 1997;106:461-5. Robotin MC, Bruniaux J, Serraf A, Uva MS, Roussin R, Lacour-Gayet F, et al. Unusual forms of tracheobronchial compression in infants with congenital heart disease. J Thorac Cardiovasc Surg 1996;112:415-23.